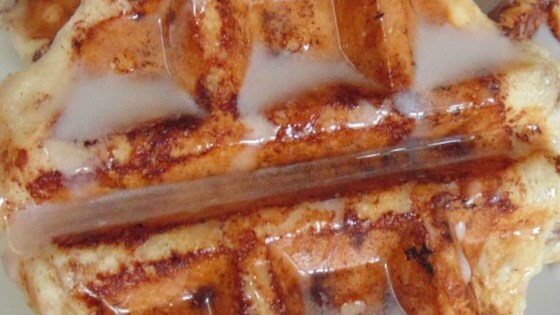 "Super easy waffles using store-bought cinnamon rolls." Preheat a waffle iron according to manufacturer's instructions. Spray the waffle iron with cooking spray. Whisk cream cheese frosting, corn syrup, and water together in a bowl until smooth. Place 1 cinnamon roll dough slice on each section of the preheated waffle iron, close the iron, and cook until waffles are golden and cooked through, 2 to 5 minutes. Repeat with remaining dough. Drizzle waffles with syrup. Eh. Great-sounding idea, but not so good in practice. The dough didn't really cook through properly. These are QUICK and EASY! my boys LOVED them and they didnt last more than an hour in our home. I really enjoyed this. It's simple easy and tastes good. Thanks for the post.